Chonburi officials say a Pattaya seafood restaurateur shown on video allegedly spraying insecticide over her fish was, in fact, using canola oil. The clip was posted on social media by a rival vendor. 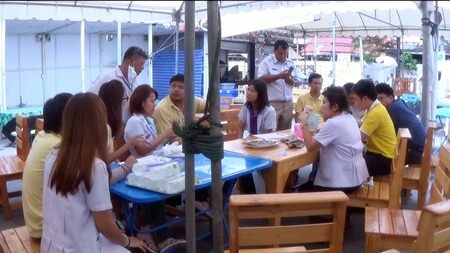 The province’s Public Health Department went to inspect Paul Thai Food and question owner Sompong Yaha, 44, about the video, which went viral on the Internet. Sompong told authorities she sprays canola oil over the fish on display to reduce the seafood smell and protect the food from flies. Buppha Songsakulchai, chief of the Consumer Protection Division of the Pattaya Public Health Department, and a Banglamung Public Health Officer went to the same shop on June 16 and confirmed oil, not pesticides, were used. Chonburi Public Health Department officials inspect Paul Thai Food, finding no insecticide was used on the restaurant’s fish. Chonburi Public Health gave her a certificate showing her use of clean and safe canola oil. Pattaya additionally certified her entire restaurant as meeting sanitary standards. Sompong, nonetheless, remained distressed over the controversy, which she fears will hurt her business. The root of the problem became clear later June 16 when Nuraasameera Manor, who owns a restaurant next to Sompong’s, went to Pattaya Police Station to admit she shot and posted the video online and continues to insist her business rival is spraying insecticide on her fish. Authorities, however, have confirmed otherwise. It is unknown if Sompong will file defamation charges against the rival business owner.